Razzle Dazzle Dazzle, Rep Porter has won Event #44: $2,500 Razz for a cool $210,615 and his second World Series of Poker gold bracelet! 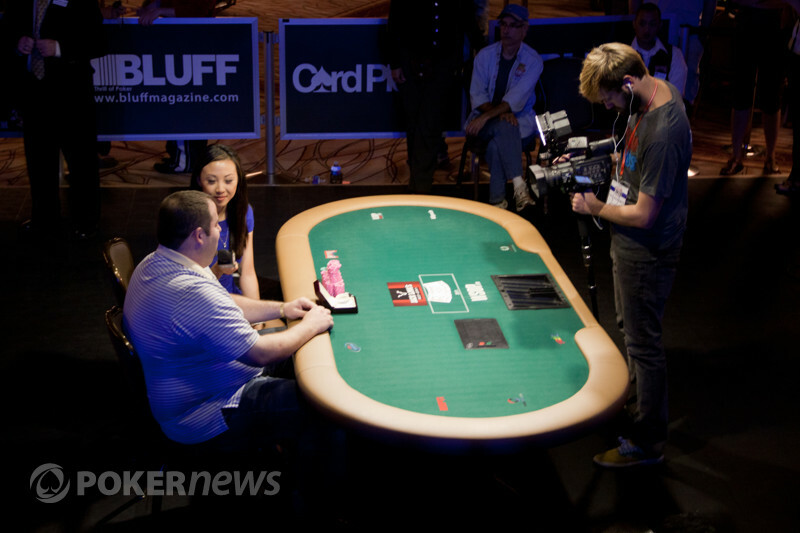 What was originally planned as a three-day event was extended to a fourth due to the ten-level stop rule at this year's WSOP. 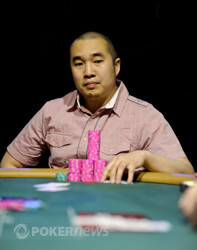 This left Stephen Su and Rep Porter, the only two remainders of a field of 363 from the first three days of play, to come back and duke it out heads up for a chance at the bracelet. Su began the day with a nearly 600,000 chip advantage over Porter with around 2,700,000 in play. On the very first hand of the day however, that deficit was eliminated when Rep Porter made a nine-low and caught Su who double paired his under-cards to only make a queen-low. The hand gave Porter the lead, a lead he would never relinquish. While Su was able to win lots of small pots, Porter found a way to win the majority of big ones to grind his opponent down to only 300,000 numerous times. Su had gotten all of his chips into the middle with that stack once but Porter laid his hand down to wait for a better spot. That spot wouldn't exactly be ideal when Su was all in on third holding / against Porter's / . Su was looking even better when he hit a on fourth and Porter paired with an . Su caught a on fifth to give him a ten-low but Porter caught a to give him some outs as long as Su didn't make a better low from that point on. Sixth changed nothing for either player but on seventh, Porter hit a to give him a nine-low and the lead. Su wasn't able to catch a better low which gave Porter the knockout and the win. Porter will walk away with $210,615 and a second gold bracelet to go along with the one he won in 2008 in a $1,500 No-Limit Hold'em Six Handed Event. Once again, we congratulate Porter and thank you all for sticking with us through four days of Razz. Stay tuned to PokerNews where we will have continuous coverage of all of the other events going on for the rest of the Series. 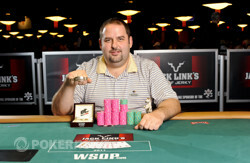 Rep Porter captures the $2500 Seven Card Razz championship bracelet. Stephen Su completed and Rep Porter raised. Su called all in and the players turned up their hands. Su started with a perfect 3-2-1 but there were still four more cards to come for each and it was far from over until anyone made a five card low. On fourth, Su hit a to give him a draw to the wheel while Porter paired up with a . Su could now lock up the double if he could hit an eight or lower on any of his remaining three cards. On fifth, Su caught a to give him a ten-low while Porter got a that gave him an nine-low draw. On sixth, Su got a useless that changed nothing while Porter received a that changed nothing for him as well. The boards read as follows going into seventh. Porter would have to catch a card that was seven or lower but not a six or a two to pull into the lead. He hit one of those cards with a to give him a nine-low and now Su would have to sweat his final card. Any card five through nine would keep Su alive and double him up. Su squeeze his final card and unfortunately for him, it was the which was no good and he was eliminated. Stephen Su completed and Rep Porter made the call. On the next two streets, Su bet out and Porter called. Both players checked the last two streets and Porter flipped over to give him a nine-low which was good when Su mucked. Once again, Su dropped down to his low point as before. Rep Porter completed and Stephen Su raised. Porter made the call and then check-called Su’s bets on the next two streets. Su moved all in blind for 65,000 out of turn on sixth and the action was on Porter. If he made the call, he would have a chance to possibly knock out Su and win the tournament. After some thought though, Porter laid it down to give Su the pot and keep him in this. Rep Porter completed and Stephen Su made the call. Su called Porter’s bet on fourth and then checked when he made the low board on fifth. Porter continued to bet and Su made the call as he checked against on sixth. This time, Porter’s bet was too much for Su however as he laid it down to drop to the same low point he was at before. Rep Porter completed and Stephen Su raised. Porter made the call and then called Su’s bet on fourth. Su bet again on fifth and for a moment, it looked like Su was going to get all in on the hand. Porter folded though which gave Su a much needed pot. Rep Porter brought in and Stephen Su called. On the next two streets, Porter bet and Su called the bets. On sixth, Porter decided to check and Su bet this time. Porter made the call as both players checked seventh. Porter revealed for a nine-low which was good when Su mucked his hand. Su is getting extremely low at this point and the next big hand could have him all in. Stephen Su completed and Rep Porter made the call. Su led out on fourth and Porter called the bet. The action was reversed on fifth where Porter had the low board and bet. Su made the call but folded with his board showing two pair on sixth after Porter bet again. Rep Porter wins the$2,500 Seven Card Razz. Kristy Arnett and Will Thomas are there to get the his reaction. Kristy Arnett gets the scoop on Rep Porter and his newest piece of jewlery. Rep Porter looks to see what Stephen Su will turnover. Event 44 bracelet winner Rep Porter and his wife.